There is a new indoor exhibit inside a small building at Old Sturbridge Village. The exhibit tells of the changing landscape around us from before the whites settled this continent, to the present day. It is an eye opening exhibit. Obviously, the forest was here for an eternity, then the Europeans came and cleared the land for farming, and pasture land, and to build villages, towns, and cities. After a period of time some farms were abandoned, some villages, too, and the forest crept back in, and after a very short time it took over the land again. It covered all trace of man. Vegetation swallowing a guardrail on Route 148. Today, we are still confronted with nature taking back what we have taken for ourselves. It's just the natural progression of things. Roads become cracked by weeds growing up and through the asphalt. Vines pulling mortar from in between bricks of buildings, the forest encroaching on the our roadways, salt deteriorating our bridges. With everything we build, at whatever cost, there is always the "after-cost" of maintenance. tree limbs above alongside the road. 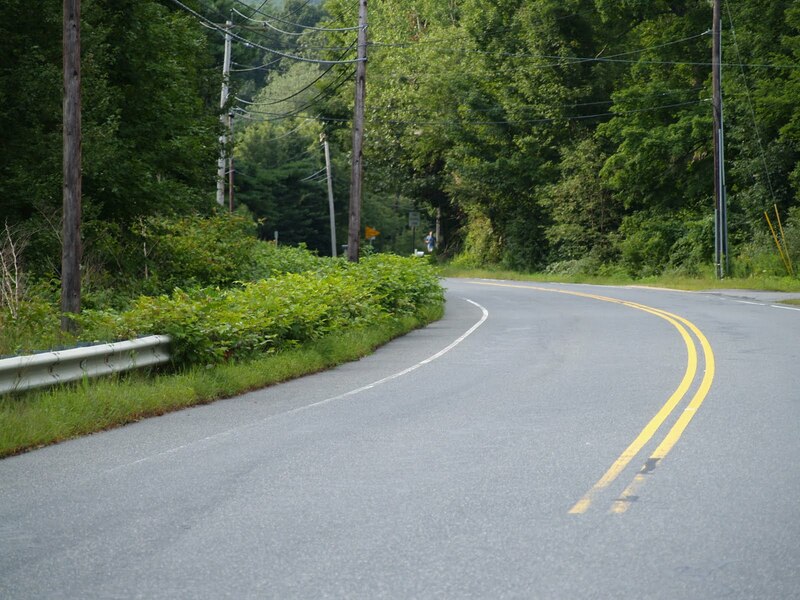 This summer we drove up to New Hampshire for a few days, and on the Kangamangus Highway the road crews had a tractor with a large articulating arm on it to trim the grass and the trees away from the road. The edges of the roadway were neatly trimmed for 12-15 feet on both sides. This accomplished a couple of things, it kept the roads neat, and shoulders clear, and it also took away the cover deer and moose would use just before darting out in front of a vehicle. Here in Sturbridge the DPW does the same thing. 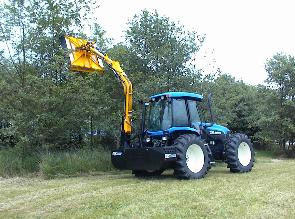 They have a tractor with a similar device that trims back all the tall grass and low hanging tree branches and brush alongside the roads. Earlier in the season they came by on Route 148, but as you can see in the photographs, the vegetation takes over very quickly. Maintenance of the roadsides, sidewalks, and the rest of our infrastructure is forever, and if we slack off it will cost us dearly in dollars and our safety. That's something to consider when making a decision about material to be used on any project. We may want visual impact, but cost, and maintenance must be the deciding factors. is waiting to be rebuilt. In 1961 a fine steel and concrete bridge was built on Haynes Street. 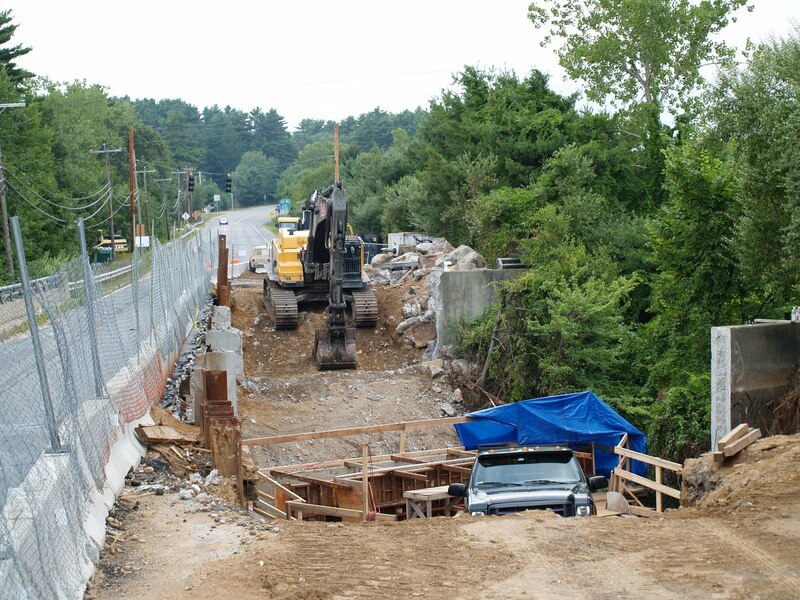 The bridge lasted barely 50 years. The life expectancy of a modern bridge is fifty to one hundred years. 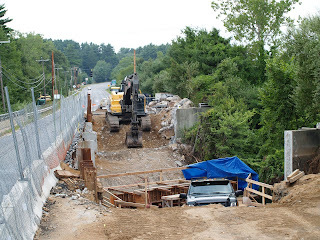 If the bridge is in an area of high salt usage a plan to clean, and wash them annually is required, and a total rehab every 20 to 30 years is necessary in order to avoid having them torn down, and rebuilt, such as is happening at the moment to that particular bridge. This bridge should have lasted many more years. I guess we need to keep in mind not only how a project will look, and function, at the present moment, but think down the road a bit about how to keep it looking like day one by properly maintaining it. Otherwise, Nature will continue to take back the land, and destroy our infrastructure. We need to cut our losses in the beginning and make wise, safe, and cost effective choices. Hmmm. Brick, stamped concrete, or plain concrete. Which has the most going for it in the long run? 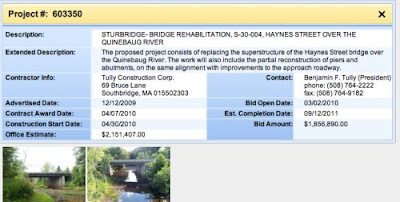 Information, and cost for the Haynes Street bridge rehabilitation. "Hmmm. Brick, stamped concrete, or plain concrete. Which has the most going for it in the long run?" It's brick in concrete, not brick in stonedust. If the concrete cracks and a weed grows, doesn't matter if there's a brick in it or not. I'm not an expert, but the newspapers have reported that experts report the maintenance is about the same. And since you bring up maintenance, what happens when those new stone walls, which are stuck together with concrete, start to fail? Maintenance. Doesn't matter how we improve, everything needs maintenance. Even a dirt road needs maintenance. Maybe we should have a town meeting to see about changing the name of the town to Drabbridge or Tightwadbridge. Brick sidewalks require more maintenance than stone walls. Let's see.... which should Sturbridge's DPW take care of first? brick sidewalks or our already existing roads? Concrete sidewalks will be maintained by the state, freeing up our DPW to take care of things in an already overstretched schedule.